This post was sponsored by Fresh From Florida as part of an Influencer Activation for Influence Central, however all opinions expressed are my own. 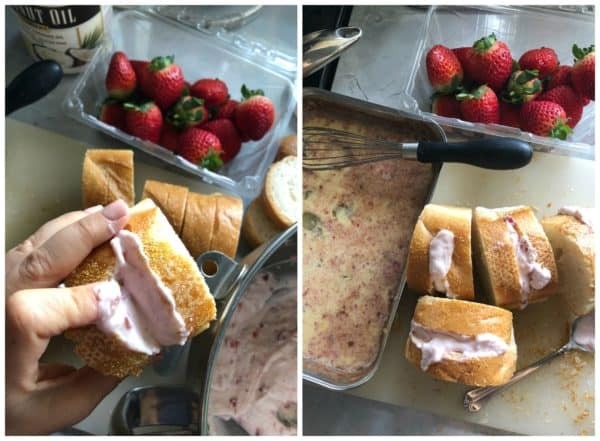 Thick slices of french bread stuffed with strawberry cream cheese. Breakfast or brunch doesn’t get any better then this! There’s no surprise that we love breakfast at my house. Every weekend you’ll find me cooking a big breakfast for my family. It’s strawberry season in Florida, and you’ll find strawberries incorporated into just about every meal in my home. I partnered with my friends from Fresh from Florida to share more about Florida strawberry season, and a delicious recipe to inspire you to use these beautiful plump sweet strawberries. I always love and look forward to Florida strawberry season. Whether I’m stocking up on berry’s at Publix or finding a U-pick farm to take my kids to. Either way–I know I’m enjoying fresh Florida strawberries. When is Florida strawberry season? Fresh From Florida strawberries are now in season in Florida! The season starts in December and runs until April. You’ll know you have Florida Strawberries when you see the Fresh From Florida seal on the label (as pictured above). 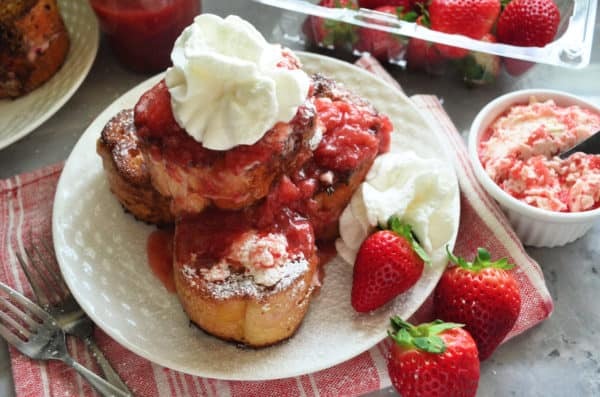 Make sure you Follow Fresh from Florida on social media (Facebook, Twitter, and Instagram) and check out their Florida Strawberry recipes. What bread is best for stuffed French toast? When making stuffed French toast I always use French bread. I buy a loaf from my local bakery a few days prior to wanting to make French toast. I like the bride to be on the harder side so that it doesn’t turn to mush when it goes into the egg and milk mixture. You could also use challah bread and cut into thicker slices. 1 to 2 day old bread is always best when making French toast. How do you make Strawberry Compote? Making strawberry compote is one of the easiest things you’ll ever make. 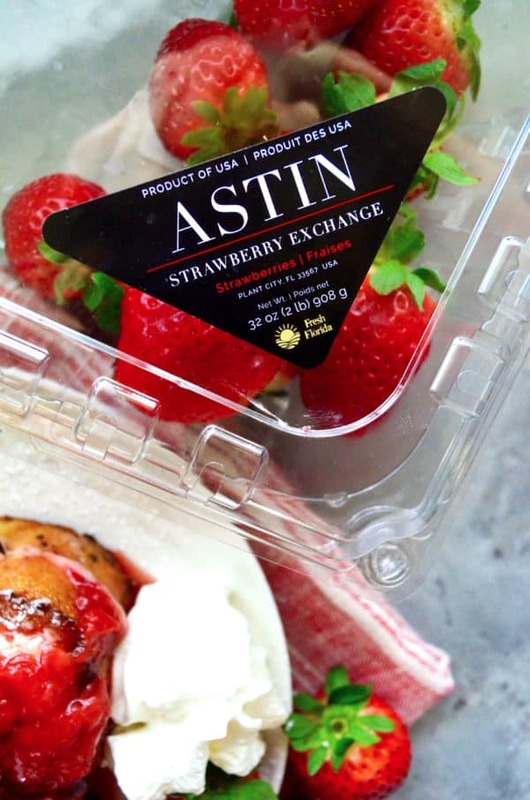 It takes just two simple ingredients; Fresh Florida Strawberries and granulated sugar! That’s it. You’ll want to rinse the berries then cut the tops off. Give the berries a rough chop, place them in a sauce pan and stir on high heat until they start to “melt”. Then reduce the heat down and let the strawberries simmer. I like to stir frequently. After about 15 minutes I’ll remove them off the heat and let the compote just sit. You can store the compote in an airtight container for up to 5 days in the refrigerator. Or you can freeze for up to 3 months. How do you make stuffed French toast? You want to cut the loaf of French bread into one and a half inch thick pieces. Then, cut halfway through the bride making sure that you don’t pierce the other side. You cut about a 2 inch opening where you will then use a spoon to place your mixture inside the bread. You can also place the mixture into a piping bag, and cut the tip off at the pit piping bag. Then you can carefully pipe in the filling. This is a much less messier way to stop your French toast. It does take an extra step or two, so it just depends if you would like to take the extra steps. I like to stuff all the French Toast first. Then, heat a pan on medium-low heat with coconut oil. This gives the french toast a sweeter exterior crust. Next, dip two pieces at a time in the egg mixture. 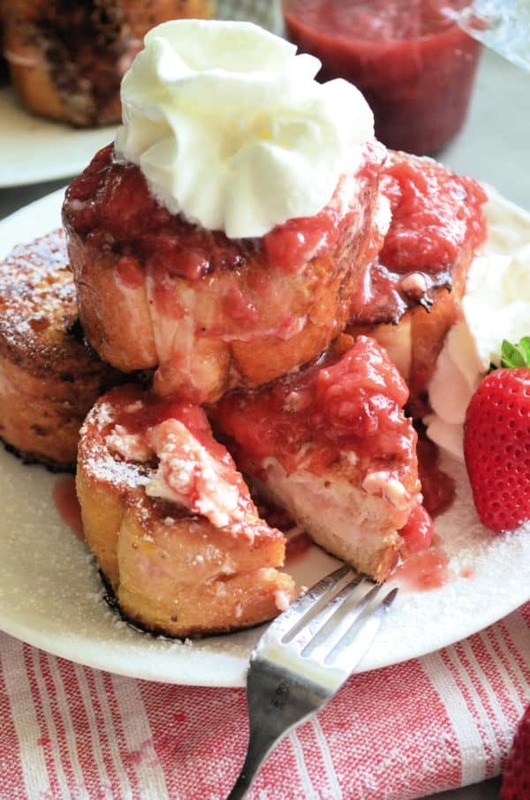 Because this is strawberry stuffed french toast I like to add a little strawberry puree to the batter. Place the french toast pieces into the pan. Cook on each side for 2-3 minutes or until golden. If your toasts starts to burn to quickly then you need to reduce the heat. Once both sides are crispy I then like to sear off the side with the filling (as pictured above in the far right photo). Serve the french toast immediately or place on a baking sheet in the oven on low heat (around 200 degrees or less) as you cook all the pieces. Then top each slice with powder sugar, strawberry butter, strawberry compote, and whipped cream. Don’t forget a few extra fresh berries on the side! 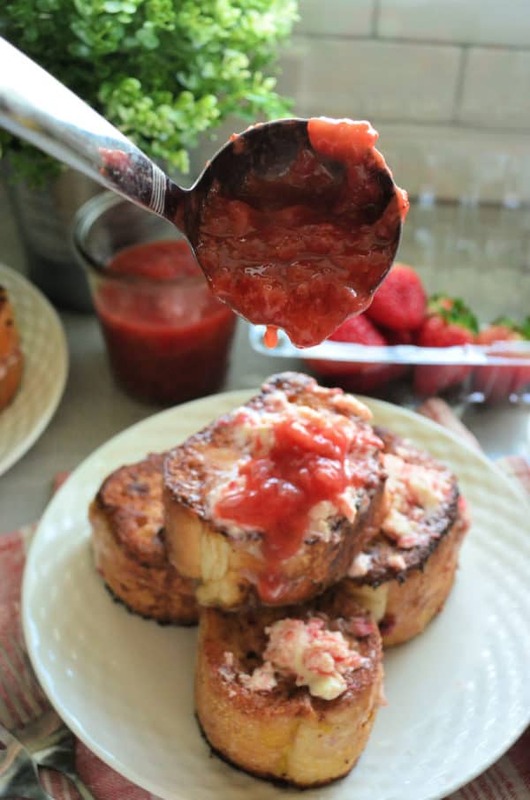 Whether you’re just cooking your family a Sunday breakfast, entertaining friends and family for brunch, or maybe you’re making breakfast for dinner my recipe for strawberry cream cheese stuffed French toast is sure to be a hit. Wash and slice tops off of 1 pint of strawberries. Roughly chop and place in a large sauce pan with granulated sugar. Place burner on high for 2-3 minutes, mix well then reduce to medium-low heat. Simmer and stir frequently for 15 minutes. Once the strawberries have formed a sauce and reduced down, remove from the heat and set to the side. Add 1/2 cup of strawberries (cleaned and stems removed) to a blender and blend until roughly pureed. Set to the side. Rinse and set to the side the remaining strawberries to serve with breakfast. To make the cream cheese filling: Using a stand mixer, cream together the cream cheese and powdered sugar. Once combined add in the finely minced strawberries. Mix well then place in refrigerator. 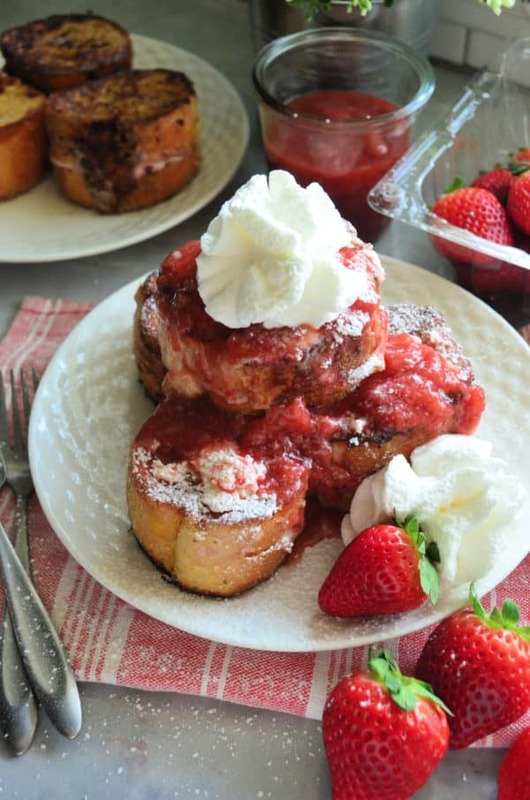 Once you have both the strawberry compote, pureed strawberries, and cream cheese filling made it’s time to make the stuffed French toast. Cut 1-1/2 inch pieces from a loaf of French Bread (you should have about 12 slices). Then, using a sharp pairing or bread knife cut a slit half way through the bread (about 2-inches wide). Repeat until you've done this with all the bread. Take a teaspoon of cream cheese filling and stuff inside the sliced bread. Repeat until all the pieces are filled. Heat a flat skillet on medium heat. Place about 1-2 tablespoons of coconut oil in the pan. While the pan heats up mix together the eggs, milk, vanilla extract and the remaining strawberry puree in a shallow dish. Dip 1 slice at a time in the mixture coating each side of the bread. Then place in the frying pan. Fry for 2-3 minutes on each side until golden brown. Once brown on both sides, flip to standing position where the seam of the cream cheese is. Frying for an additional minute. Remove from the pan and serve immediately or place on a baking sheet and stick the stuffed french toast in the oven on low until all 12 pieces are done cooking. Repeat until all slices are cooked. Top each slice with powder sugar, strawberry butter, strawberry compote, and whipped cream as well as the remaining fresh Florida strawberries.